Celery is not usually thought of as a vegetable to be served outside of crudités or in salads, and that’s a shame. It has a delicate flavor and a clean taste that often surprises those who have never experienced it cooked. 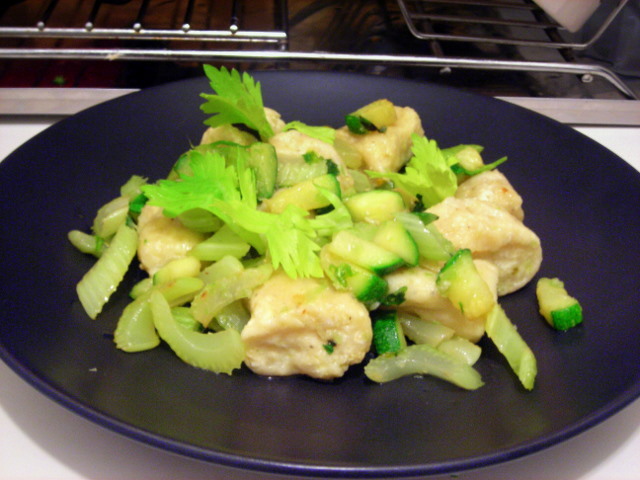 Here, I’ve briefly sautéed it in a little butter with some zucchini and green garlic. Chopped mint and celery leaves are added at the end, along with a touch of salt. This is wonderful paired with a glass of white wine, such as a sauvignon blanc or a riesling. 05 Jun	This entry was published on June 5, 2009 at 12:54 am. It’s filed under food, general and tagged celery, dinner, gnocchi, mint, ricotta, vegetables, vegetarian, zucchini. Bookmark the permalink. Follow any comments here with the RSS feed for this post. I love the yummy crunch of celery…..